The stomata are the pathways through which transpiration and gaseous exchange take place. The stomata are elliptical pores in the epidermis of plants. They occur mostly on the under surface of leaves. A stoma is bordered by two guard cells. The guard cells are specialized epidermal cells. The guard cells are smaller in size than the other epidermal cells. They are kidney shaped in surface view. But they are elongate in gamily gramineac. In some species of grasses. the epidermal cells adjacent to the guard cells arc different in shape and size from the other the epidermal cells. These are known as subsidiary cells or accessory cells. Guard cells have some specific features. (i) The guard cells are modified epidermal cells. But they are different shape. contents and metabolism. They contain mitochondria, peroxisomes and endoplasm ie reticulum. 00 They also contain chloroplast. Chloroplasts are absent in all other epidermal cells. (iii) The starch grains present in guard cells decrease during the day time. 13tit increase during night. On the other hand starch accumulates during the day and consumed during the night in the other epidermal cells of the leaf. (iv) I– he inner v, all of the guard cells surrounding the pore is thick. But it outer \sail is thin. these variations occur in different species. Sometimes, their size is different in the different lea \es ofthe same plant and in the same leaf at different points. The number of stomata varies from 50 and 300 per square mm. But their total area does not exceed I to “o of the entire surlhcc. There are different categories of plants 1kw position of stomata. (i) Apple and Mulberry Types: These have stomata only on the under surface of the leaf. Its examples are peach walnut oak. apple and mulberry. (ii)Potato Type: In this case. the stomata are more numerous on the under side than on the upper surface of the leaf. Its example is cabbage, bean, pea and tomato. (iii)Oat Type: Stomata are more or less equally distributed on the two surfaces. Most of the cereals like wheat and maize belong to this category. (v) Potamogeton Type: In this ease stomata are altogether absent. If they are present, they are functionless and vestigial. Most of the submerged aquatic plants belong to this category. and inelastic. It resists stretching. Rut their outer all is thin and elastic. Si) it can be stretched. The differences between the inner and outer walls of the guard cells are responsible ibr opening and closing of the stomata. (a) Gain of turgor: ‘lite guard cells absorb and N\ atcr become turgid. (b) Loss of tumor: The guard cells loss %%titer. So they loss of turgor. .1–herefore. the inner walls of the guard cells become straight. lite walls of both guard cells come close to each other and the stomata pore becomes narrow and finally closes. Follow ing theories explains the change of osmotic concentration in the guard cells. l’his hy pothesis was formulated In S.D. Sayre in 1926. According to this hypothesis, one of the important en’) mes present in the guard cells is starch phosphorylase. It is re ersible en/y me. Its action is controlled lw p11 of cells. insoluble and osmotically Mactitt. M.1 glucose phosphate is soluble. So it increases the osmotic pres awe of guard cells. As a result. unser from adjacent epidermal cells enters the sward cells. The guard cells become turgid and are opened. Low pH: Carbon dioxide accumulates in the dark. It reacts s ith water to from carbonic acid If IA.00. .Thereliwe. IA I decreases. Therefore. the reaction becomes reversal. Non smile enzyme cons ens glucose-l-phosphate into starch. Starch is insoluble in water. ‘therefore. the osmotic pressure of guard cells decreases. As a result the guard cells lose water and become flaccid. It closes the stomata. I. Sonic plains “ere exposed to a pours of ammonium hydroxide in the dark. It increases the pH. 1 here fore. the stomata sere opetted iui darkness. Similarly. sonic plants are exposed to glacial acetic acid at Litt) time. 1 heir pit decreases .So their stomata are closed during the day time. Some wavelengths of light, blue and the red affect the stomata opening and photos y ti thesis I herelae. the action spectrum for stomata opening and photosynthesis is same.The phosphorylase is very active enzyme. It converts starch into sugar and sugar into starch rapidly. It is estimated that one enzyme can convert 1000 molecules of starch per second into sugar. This speed is enough to open and close stomata rapidly.
. Starch is absent in some plants like onion. But still their stomata open and close. I. Stomata can open in v en dim sunlight or even in moonlight. Photosynthesis cannot take place at this intensity. 3. Steward (1964) pointed out that inorganic phosphate itself is osmotic-ally active. Therefore. the conversion of starch to glucose phosphate does not affect osmotic pressure of guard cells. presence of light. It is believed that walk: acid is produced in the chloroplasts. Then it is excreted into the odoplasm of the guard cells. Malic acid is a weak acid. .1hcrefore. it dissociates into malate ions and hydrogen (II–) ions. 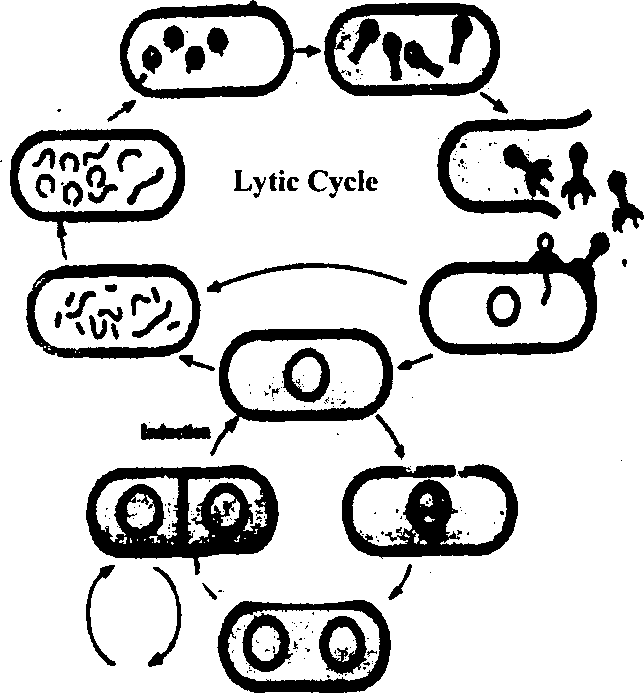 Lk drogen ions arc excreted from the plan: cells and potassium ions (1: enter the guard cells iron neighboring cells. ‘1ims exchange of hydrogen and potassium ions. between guard cells and adjacent epidermal cells takes place. This ion exchange is an active process. It needs expenditure of metabolic energy. 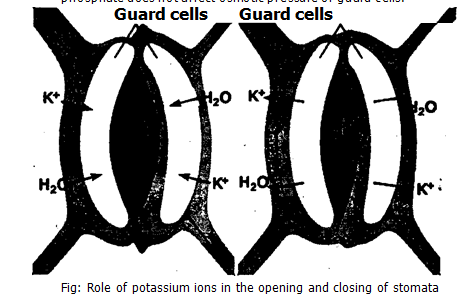 Accumulation of potassium and malate ions in guard cells increase in the osmotic pressure of guard cells. Therefore, water flow into guard cells. The guard cells become turgid and are opened. Latest research has revealed that the level of CO, in the guard cells and blue light affect the potassium ion exchange. Low level of CO2 and blue light enable the guard to take in K ion. So stomata are opened. But high level of CO, and absence of blue Iight reverse the affect and stomata are closed.